Fibromyalgia syndrome (FM) is a chronic pain syndrome that has been defined by widespread pain for more than 3 months and the presence of ≥11 out of 18 tender points . In addition, most FM patients complain of disturbed sleep, emotional distress, and pronounced fatigue. FM represents the extreme end of the spectrum of musculoskeletal pain in the general population and is a chronic illness that disproportionably affects women (9:1 ratio of women to men affected). Like many other clinical syndromes, FM has no single specific feature but represents a symptom complex of self reported or elicited findings. Pain in FM is consistently felt in the musculature and is related to sensitization of central nervous system (CNS) pain pathways. Although not specific for FM, abnormal concentration of CNS neuropeptides, biogenic amines, and alterations of the hypothalamic-pituitary-adrenal axis have been described [2–5]. There is a large body of evidence for a generalized lowering of pressure pain thresholds in FM patients [6–10], but the mechanical pain hypersensitivity (allodynia) of FM patients is not limited to tender points and appears to be widespread . In addition, almost all studies of FM patients have shown abnormalities of pain sensitivity while using different methods of sensory testing. Although relevant for many clinical pain syndromes like FM, nociception alone cannot explain the human pain experience because it always undergoes modulation in the CNS by conscious and unconscious mental activity . In addition, socio-cultural influences, beliefs or biases can strongly influence pain, particularly those related to cause, control, duration, outcome, and blame. These beliefs are frequently linked to negative emotions, like anger, fear, and depression . Generally, pain has two emotional components, including the unpleasantness of the sensation (primary pain affect) as well as negative feelings like depression, anger and fear (secondary pain affect). This relationship of emotions with pain is bidirectional because modulation of negative feelings can powerfully alter the pain experience . Due to the fact that pain is a personal (first person) experience it can only be partially captured by definitions. The International Association for the Study of Pain has defined pain as an "unpleasant sensory and emotional experience associated with actual and potential tissue damage or described in terms of such damage" . This definition of pain, however, has significant shortcomings because it does not encompass all aspects of pain. Thus, abnormalities of pain processing appear to play an important role for FM pain, particularly those related to deep tissue impulse input, central sensitization, and mood abnormalities. Some of the important contributions of abnormal central pain mechanisms to clinical FM pain include temporal summation of pain (or windup) and central sensitization. FM is a pain amplification syndrome of patients who are highly sensitive to painful and non-painful stimuli, including touch, heat, cold, chemicals, light, sound, and smell. The cause for the heightened sensitivity of FM patients is unknown, but is likely to involve abnormalities in CNS sensory processing as well as peripheral tissue abnormalities. Central abnormalities appear to be related to blunting of the hypothalamic-pituitary axis responses to stressors [15, 16], increased levels of substance P [2, 17], excitatory amino acids  and neurotrophins  in the cerebro-spinal fluid of FM patients. Although previous FM studies did not show consistent peripheral tissue abnormalities , more recent evidence points to possibly relevant alterations in skin and muscles. These abnormalities include increased substance P in muscle tissue , DNA fragmentation of muscle fibers , increased IL-1 in cutaneous tissues , and muscle perfusion deficits [24, 25]. These peripheral changes may contribute to increased tonic nociceptive input into the spinal cord that results in augmented windup and central sensitization. In addition, there is compelling evidence for the contribution of peripheral pain to overall clinical pain in FM . In a large study of FM patients, ratings of peripheral pain areas accounted for 27% of the variance of overall clinical pain , thus emphasizing the important role of peripheral impulse input for FM pain. These findings represent a possible link between peripheral input and FM pain. Importantly, nociceptive activity in peripheral tissues of FM patients does not necessarily have to be extensive, because central sensitization requires little sustained input for the maintenance of the sensitized state and chronic pain . Despite increasing evidence emphasizing the role of sensory abnormalities in chronic widespread pain in FM, the contribution of psychological factors to FM pain must also be recognized. Several psychological risk factors for FM are common in Western populations, including somatic symptoms, negative life events , psychological distress , increased focus on bodily symptoms , and passive pain-coping mechanisms . Both community and clinic patients with FM are also more likely than the general population to have a diagnosis of psychiatric disorders, particularly depression and anxiety [31, 32]. In a prospective study of 214 women with self-reported pain, 39 (18%) were diagnosed with FM at study entry, and 33% satisfied FM criteria after 5.5 years of follow up . Self-reported depression at baseline was associated with a more than six-fold increased likelihood of reporting FM symptoms at follow up and was found to be the strongest independent predictor. In addition, psychosocial factors, including high levels of distress, fatigue, and frequent health care seeking behavior, are strong predictors for chronic widespread pain and FM . In this context, several studies have reported FM to be co-morbid with major depressive disorder [35, 36]. A recent large family study of FM subjects showed that FM and major depressive disorder are characterized by shared, familial risk factors , thus emphasizing the strong relationship between negative affect and FM pain. Although heightened pain sensitivity is a hallmark of FM, little is known about the genetic and other factors that contribute to this abnormality. Tissue sensitization after injury has long been recognized as making an important contribution to pain. This form of sensitization is related to changes in the properties of primary nociceptive afferents (peripheral sensitization), whereas central sensitization requires functional changes in the CNS (neuroplasticity). Such CNS changes can result in central sensitization, which manifests itself in several ways, including increased excitability of spinal cord neurons after an injury, enlargement of the receptive fields of these neurons, reduction in pain threshold, or recruitment of novel afferent inputs. Behaviorally, centrally sensitized patients like FM sufferers report abnormal or heightened pain sensitivity with spreading of hypersensitivity to uninjured sites and the generation of pain by low threshold mechano-receptors that are normally silent in pain processing. Thus, tissue injury might not only cause pain but also an expansion of dorsal horn receptive fields and central sensitization. Central sensitization can occur as an immediate or delayed phenomenon , resulting in increased sensitivity of wide dynamic range and nociception specific neurons of the spinal cord. Whereas delayed central sensitization depends mostly on transcriptional and translational neuronal changes during afferent barrage, immediate central sensitization relies mainly on dorsal horn receptor mechanisms, including the N-methyl-D-aspartate (NMDA) and neurokinin-1 receptors . Peripheral nociceptors can become increasingly sensitive after tissue trauma and/or after up-regulation of nociceptor expression in peripheral nerve endings. Subsequent activation of these receptors will lead to increased firing rates and pain. This mechanism (peripheral sensitization) seems to play an important role in FM pain, although only indirect evidence is available at this time to support this assumption . Impulses from peripheral nociceptors are transmitted to the CNS by myelinated A-δ (first pain) and unmyelinated C-fibers (second pain). A-δ mediated pain signals are rapidly conducted to the CNS (at about 10 m/s), whereas C-fiber impulses travel relatively slowly (at about 1.6 m/s). When the distance of C-fiber transmission is sufficiently long (like the length of the arm or leg) this delay of C-fiber compared to A-δ fiber impulses can be easily detected by study subjects. An important test of central pain amplification relies on summation of second pain or windup . This technique reveals sensitivity to input from unmyelinated (C) afferents and the status of the NMDA receptor system , which is implicated in a variety of chronic pain conditions. Thermal, mechanical, or electrical windup stimuli can be applied to the skin or musculature of patients and commercial neurosensory stimulators are readily available for windup testing. In 1965, Mendell and Wall described for the first time that repetitive C-fiber stimulation can result in a progressive increase of electrical discharges from second order neurons in the spinal cord . This important mechanism of pain amplification in the dorsal horn neurons of the spinal cord is related to temporal summation of second pain or windup. First pain, which is conducted by myelinated A-δ pain fibers, is often described as sharp or lancinating and can be readily distinguished from second pain by most study subjects. In contrast, second pain (transmitted by unmyelinated C-fibers), which is strongly related to chronic pain states, is most frequently reported as dull, aching, or burning. Second pain increases in intensity when painful stimuli are applied more often than once every three seconds (Figure 1). This progressive increase represents temporal summation or windup and has been demonstrated to result from central rather than a peripheral nervous system mechanism (Figure 1). Animal studies have demonstrated similar windup of C afferent-mediated responses of dorsal horn nociceptive neurons and this summation has been found to involve NMDA receptor mechanisms. Importantly, windup and second pain can be inhibited by NMDA receptor antagonists, including dextromethorphan and ketamine [43–45]. Temporal summation of second pain (windup). 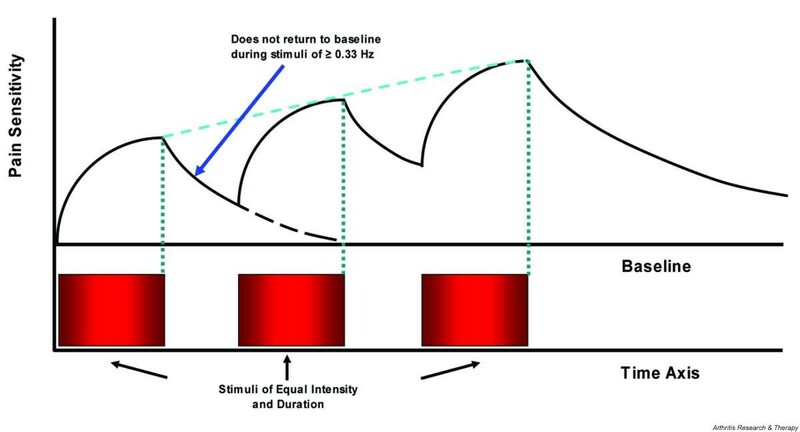 When identical stimuli are applied to normal subjects at frequencies of ≥0.33 Hz, pain sensations will not return to baseline during the interstimulatory interval. Windup is strongly dependent on stimulus frequency and is inversely correlated with interstimulatory interval . In contrast to normal subjects, FM patients windup at frequencies of < 0.33 Hz and require lower stimulus intensities . Recent investigations in FM patients have focused on windup and central sensitization because this chronic pain syndrome is associated with extensive secondary hyperalgesia and allodynia . Several studies provided psychophysical evidence that input to central nociceptive pathways is abnormal in FM patients [40, 47–51]. When windup pain is evoked both in FM patients and in normal controls, the perceived pain increase by experimental stimuli (mechanical, heat, cold, or electricity) is greater for FM patients compared with control subjects, as is the amount of temporal summation or windup within a series of stimuli (Figure 2). Following a series of stimuli, windup after-sensations are greater in magnitude, last longer and are more frequently painful in FM subjects. 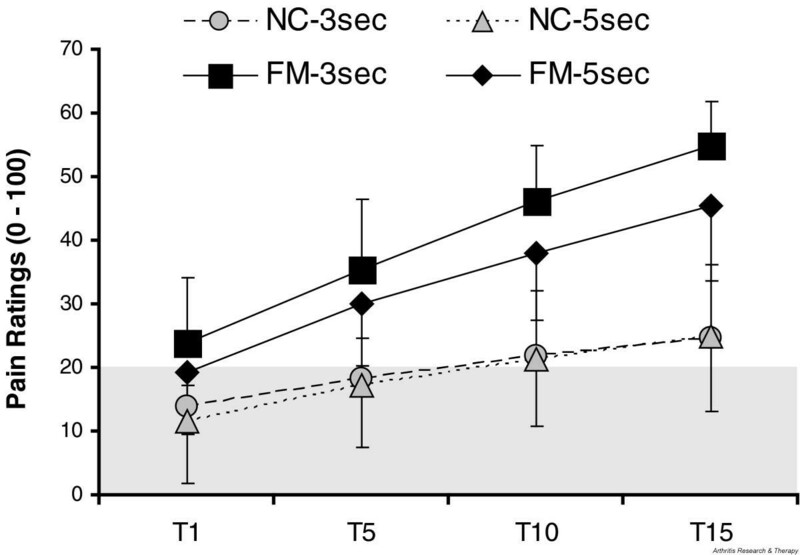 These results indicate both augmentation and prolonged decay of nociceptive input in FM patients and provide convincing evidence for a role for central sensitization in the pathogenesis of this syndrome. Windup pain ratings of normal control (NC) and fibromyalgia syndrome (FM) patients. All subjects received 15 mechanical stimuli (taps (T)) to the adductor pollicis muscles of the hands at interstimulatory intervals of 3 s and 5 s. FM patients showed mechanical hyperalgesia during the first tap and greater temporal summation than NCs at both interstimulatory intervals. A numerical pain scale was used (0 to 100). The shaded area represents pain threshold. Several important points appear relevant for clinical practice. As previously mentioned, when central sensitization has occurred in chronic pain patients, including FM patients, little additional nociceptive input is required to maintain the sensitized state. Thus, seemingly innocuous daily activities might contribute to the maintenance of the chronic pain state. In addition, the decay of painful sensations is very prolonged in FM and patients do not seem to experience drastic changes in their pain levels during brief therapeutic interventions. Many frequently used analgesic medications do not improve central sensitization, and some medications, including opioids, have been shown to maintain or even worsen this CNS phenomenon. Sustained administration of opioids in rodents over one week can not only elicit hyperalgesia but also induce neurochemical CNS changes commonly seen with inflammatory pain . Thus, long-term analgesic therapy may sometimes result in unintended worsening of the targeted pain processing abnormalities. The important role of central pain mechanisms for clinical pain is also supported by their usefulness as predictors of clinical pain intensity in FM patients. Thermal windup ratings correlate well with clinical pain intensity (Peason's r = 0.53), thus emphasizing the important role of this pain mechanism for FM. In addition, hierarchical regression models that include tender point count, pain related negative affect, and windup ratings have been shown to account for 50% of the variance in FM clinical pain intensity . The mechanisms underlying the central sensitization that occurs in patients with FM relies on hyperexcitability of spinal dorsal horn neurons that transmit nociceptive input to the brain. As a consequence, low intensity stimuli delivered to the skin or deep muscle tissue generate high levels of nociceptive input to the brain as well as the perception of pain. Specifically, intense or prolonged impulse input from A-δ and C afferents sufficiently depolarizes the dorsal horn neurons and results in the removal of the Mg2+ block of NMDA-gated ion channels. This is followed by the influx of extracellular Ca2+ and production of nitric oxide, which diffuses out of the dorsal horn neurons. Nitric oxide, in turn, promotes the exaggerated release of excitatory amino acids and substance P from presynaptic afferent terminals and causes the dorsal horn neurons to become hyperexcitable. Subsequently, low intensity stimuli evoked by minor physical activity may be amplified in the spinal cord resulting in painful sensations. Accumulating evidence suggests that dorsal horn glia cells might have an important role in producing and maintaining abnormal pain sensitivity [54, 55]. Synapses within the CNS are encapsulated by glia that do not normally respond to nociceptive input from local sites. Following the initiation of central sensitization, however, spinal glia cells are activated by a wide array of factors that contribute to hyperalgesia, such as immune activation within the spinal cord, substance P, excitatory amino acids, nitric oxide, and prostaglandins. Precipitating events known to induce glial activation include viral infections, including HIV, hepatitis C, and influenza . Once activated, glia cells release proinflammatory cytokines, including tumor necrosis factor, IL-6 and IL-1, substance P, nitric oxide, prostaglandins, excitatory amino acids, ATP, and fractalkine , that, in turn, further increase the discharge of excitatory amino acids and substance P from the A-δ and C afferents that synapse in the dorsal horn and also enhance the hyper-excitability of the dorsal horn neurons [54, 58]. Recent evidence also points towards a possible role for NMDA receptors in glial activation and pain . As a normal response to tissue trauma, injury is followed by repair and healing. Inflammation occurs, which results in a cascade of electrophysiological and chemical events that resolve over time and the patient becomes pain free. In persistent pain, however, the local, spinal, and even supraspinal responses are considerably different from those that occur during acute pain. While defining the relationship between tissue events and pain is necessary for understanding the clinical context of these pathologies, defining the relationship between injury and specific and relevant nociceptive responses is crucial for understanding the central mechanisms of persistent pain in FM. It must be emphasized, however, that specific abnormalities in persons with FM have not been identified that might produce the prolonged impulse input that is necessary to initiate the events underlying the development of central sensitization and/or spinal glia cell activation. After central sensitization has occurred, low threshold A-β afferents, which normally do not serve to transmit a pain response, are recruited to transmit spontaneous and movement-induced pain. This central hyperexcitability is characterized by a 'windup' response of repetitive C fiber stimulation, expanding receptive field areas, and spinal neurons taking on properties of wide dynamic range neurons . Ultimately, A-β fibers stimulate postsynaptic neurons to transmit pain, where these A-β fibers previously had no role in pain transmission, all leading to central sensitization. Nociceptive information is transmitted from the spinal cord to supraspinal sites, such as the thalamus and cerebral cortex, by ascending pathways. A potential source of nociceptive input that might account for FM pain is muscle tissue . Several types of muscle abnormalities have been reported in FM patients, including the appearance of ragged red fibers, inflammatory infiltrates, and moth-eaten fibers [62–64]. Possible mechanisms for such muscle changes might include repetitive muscle microtrauma, which could contribute to the postexertional pain and other painful symptoms experienced by these patients. In addition, prolonged muscle tension and ischemia was found in muscles of FM patients [25, 65, 66]. Changes in muscle pH related to ischemia  might provide a powerful mechanism for the sensitization of spinal and supraspinal pain pathways . Investigations using 31P nuclear magnetic resonance spectroscopy have shown that FM patients display significantly lower phosphorylation potential and total oxidative capacity in the quadriceps muscle during rest and exercise . FM patients also exhibit significantly lower levels of muscle phosphocreatine and ATP, as well as a lower phosphocreatine/inorganic phosphate ratio [62, 63]. Furthermore, nuclear magnetic resonance testing of muscles in FM patients showed an increased prevalence of phosphodiester peaks, which have been associated with sarcolemmal membrane damage [69, 70]. Focal muscle abnormalities, including trigger points, are frequently detectable in FM patients and may play an important role as pain generators. Using sensitive microdialysis techniques, concentrations of protons, bradykinin, calcitonin gene-related peptide, substance P, tumor necrosis factor-α, IL-1b, serotonin, and norepinephrine have been found to be significantly higher in trigger points than normal muscle tissue [71, 72]. Recent studies have shown that advanced glycation end products may also be relevant for FM pain. These can trigger the synthesis of cytokines, particularly IL-1b and tumor necrosis factor-α, and elevated advanced glycation end product levels have been detected in interstitial connective tissue of muscles and in serum of FM patients . All these biochemical mediators can sensitize muscle nociceptors and thus indirectly contribute to central sensitization and chronic pain. Because nociceptive input from muscles is very powerful in inducing and maintaining central sensitization , FM muscle abnormalities may strongly contribute to pain through important mechanisms of pain amplification. FM is a chronic pain syndrome that is characterized by widespread pain in peripheral tissues, psychological distress, and central sensitization. Whereas the role of psychological factors in FM patients' pain has been well established, little is known about the origin of the sensory abnormalities for pain. Deep tissue impulse input is most likely relevant for the initiation and/or maintenance of abnormal central pain processing and represents an important opportunity for new treatments and prevention of this chronic pain syndrome. Three important strategies for FM therapy appear useful at this time: reduction of peripheral nociceptive input, particularly from muscles; improvement or prevention of central sensitization; and treatment of negative affect, particularly depression. The first strategy is most likely relevant for acute FM pain exacerbations and includes physical therapy, muscle relaxants, muscle injections, and anti-inflammatory analgesics. Central sensitization can be successfully ameliorated by cognitive behavioral therapy, sleep improvement, NMDA receptor antagonists, and anti-seizure medications. The pharmacological and behavioral treatment of secondary pain affect (anxiety, anger, depression) is equally important and may currently be one of the most powerful interventions for FM pain. Whether narcotics are useful for the treatment of FM pain is currently unknown because of insufficient trial experience. This review is part of a series on "Biology and therapy of fibromyalgia" edited by Leslie Crofford. Other articles in this series can be found at http://arthritis-research.com/articles/review-series.asp?=ar_fibromyalgia. Supported by NIH grant NS-38767 and the American Fibromyalgia Syndrome Association.